Hi there, my darlings! As part of the FRIEND-AN-INDIE-FRIDAY featured giveaways, I'll also be posting a review of some of the new brand's creations as well as an exclusive interview with each maker, so people can get a little glimpse into the world of the face behind the brand! Today, I present Joanne of Daphine Polish!! Read on to find out exactly why I love this woman so! I could go all the way back to my love of art and design, but basically I started as a lover of nail polish and indie polish. I saw all the beautiful polishes that people were putting out and thought that I could do that myself, at least as a hobby. I started mixing and experimenting early last year and I joined a group for polish makers on Facebook. When I got a lot of positive responses about a color I made, I decided to give the business a try. That color was released as Surf & Sand, and it's been a customer favorite! 2. What was the inspiration for the name "Daphine Polish"? Daphine was a nickname I acquired in middle school from a friend who saw a nametag a waitress was wearing in our local Chinese all-you-can-eat-buffet (see Babi, it's always got to do with the buffet!) and said, "You look like a Daphine!" It just stuck after that, even though it has nothing to do with my real name! When I was trying to decide on a name for the business, I wanted something unique and personal so Daphine was the obvious choice. So many things! My very first collection was inspired by Daria, my favorite TV show as a teen. I love mythology so that inspired the Goddess of the Two Lands collection and some of the names out of the What Sorcery is This? collection. The Top Ten collection for spring is all song titles from some of my favorite bands and singers. The next collection that I am working on is inspired by one of my favorite book trilogies - I'm so excited about it! I read the first book when I was about 10 years old in summer camp (yeah I may be a big nerd, reading at camp :P) and I consider these books my introduction to all things sci-fi and fantasy. I can't wait to share these with you! 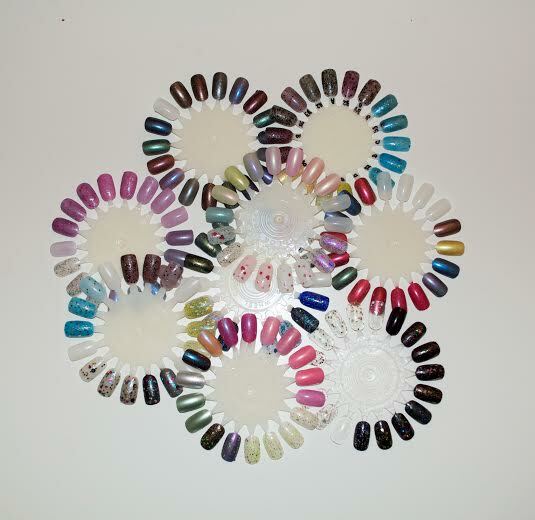 Since I started out as a lover of nail polish, there are a ton of indies out there that I love! Just to name a few (in no particular order! ): Pahlish, Scofflaw Nail Varnish, Indigo Bananas, Shimmer Polish, Rainbow Honey, Cirque. My favorite mainstream brands are Butter London and OPI. My favorite color for polish seems to be purple, I create a lot of purple when I'm just throwing things together. In the summer I like bright blues and neon pinks or corals. Holos are also great when the sun comes out to play! In the fall I like vampy colors like plum and burgundy. This always changes as I make new colors but Surf & Sand is a favorite because it's the first "official" color I made. Right now I'm super in love with Nimue from the What Sorcery is This? collection and ...and Goodnight from the Mother's Day duo. Both have amazing shimmer! I have never been good at sticking with things but I have had a lot of crafty hobbies. I used to make jewelry and I can probably still crochet you a scarf. I can sew - I was a whiz at pajama pants and I made the purse I took to Senior Prom. I picked up painting in college and I enjoyed that for a while. Nail polish is the one that has stuck with me, probably because I love glitter and shiny things! As of now I think my only other hobby is binge watching TV shows on Netflix, I just finished all 8 seasons they have of Supernatural. I love the feedback and interacting with customers! I read every comment on my Facebook page and Instagram, and I try to respond to as many of them as I can. One of the biggest challenges is really getting a foothold in the market, right now there are hundreds of indie brands out there so whenever I get a repeat customer it's a really big deal! If that's you, I'm sending you kisses and love and glitter! If you are considering starting your own brand I have two pieces of advice. Number one: Test! Test everything: base, glitters, pigments, etc. Test them separately and mixed. Test it on yourself, on your friends, on your husband/wife or boyfriend/girlfriend. You want to put out the best product you can! Number two: do your research on the business side of things. While a lot of it is mixing fun colors and playing with glitter, when you start an indie polish brand you are becoming a small business owner. There are legal steps that need to be taken like licenses, taxes, and insurance, which all vary by state (or country). Overall, I am so happy that I decided to start my own brand! It's a lot of hard work and I do feel like I'm always working (I work a 9-5 day job as well as run Daphine Polish) but I love creating new colors and seeing the response to them. I really love the relationships I've built with other makers and bloggers and the support and feedback they provide. Also it's great to be able to talk polish with other polish addicts! Favorite comfort food : I have to pick one?! Haha probably a cheeseburger and fries from a diner. It's got to be from a diner. Favorite beauty item besides polish : Eyeshadow, I'm dying to get my hands on the Naked 3 palette! Favorite vacation destination : I would love to go to Florence (I'm a big art history nerd) but so far the best places I have actually been were Puerto Rico, and Nice, France. Favorite celebrity : I don't know if I have one! Oh how about Misha Collins! Most recent movie you loved : I really enjoyed The Monuments Men because as I said, art history nerd! Favorite TV show and character : Oooo just one TV show? It's a toss up between Firefly, Torchwood, and Buffy the Vampire Slayer. Favorite character is probably Captain Jack Harkness from Doctor Who and Torchwood. 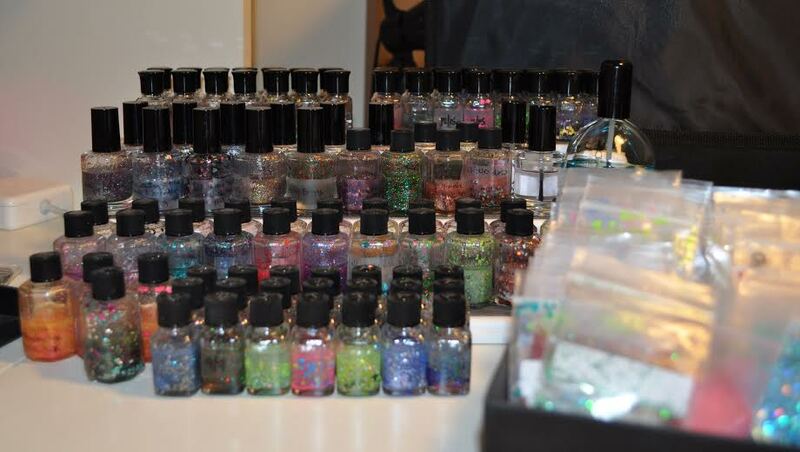 If you won a million dollars, first thing you would buy is : a big vat of Spectraflair so I could holo all the things! Also a giant cat tree because I am an crazy cat lady. So there you have it, my darlings! A little glimpse into the world of Joanne of Daphine Polish! I love this woman so and I'm SO glad this blog and her brand brought us together! Check out her creations, such as Surf and Sand mentioned above, HERE! LOVE this interview! Especially the fun facts at the end.